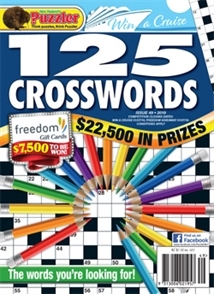 For puzzlers who love their crosswords, 125 Crosswords offers the best in traditional crossword puzzle fun. Most of the puzzles are based on a standard 13x13 grid – the perfect size to pick up and solve in one sitting over a relaxing cup of coffee and a biscuit. For a deeper challenge, there are 27 larger 19x19 grids, and for the maximum puzzle workout, six jumbo grids. Each issue is hand-compiled specifically for New Zealand, so you'll find no strange overseas terms, nor will you be stumped by strange and obscure words. Instead the puzzles provide an accessible and thought-provoking challenge, and feature a smattering of film and television references to keep you on your pop culture toes. For straightforward puzzle fun, and the chance to win a great prize in each issue, head straight to 125 Crosswords.